One of the beautiful things about Ethereum is that every single transaction happening on its blockchain is open to the world. From a data perspective, this means that there is an abundance of interesting analyses we can perform, and insightful metrics we can calculate from these transactions. In particular, one area that has not yet received much attention yet is token retention – that is, what % of wallets hold onto their tokens over some time. Given the popularity of “HODL”, it’s quite surprising that we haven’t seen many hard metrics on token retention yet (although Dhruve Bansal did perform an excellent piece of analysis on Bitcoin’s “HODL Waves”). After all, the transactional data of ERC20 tokens are readily available for us to study. Dealing with Ethereum data is not exactly plug-and-play, but at CoinFi we ingest these transactions as a part of our data warehouse, allowing for easy access and analysis. But before digging into the data, let’s look at how we define retention. How Do We Define Token Retention? The area of retention has been studied extensively in the mobile apps space. And there are a couple of ways to measure user retention that we can leverage when it comes to tokens, and ICOs in particular. Amplitude has some great literature if you’re interested in how user retention is measured in the mobile apps space. For our purpose, let’s bring the simplest definition of user retention into the token world: N-day retention. N-day retention for apps says: what % of users are still active N days after first installing the app? In the token world, we can make an analogous definition for ICO participants: What % of ICO participants (wallets) still hold their tokens N days after the tokens have been distributed and unlocked? Wallets are not 1:1 with people. People can have multiple wallets. And in fact, multiple people can share the same wallet (e.g. in ICO pools). We’re only capturing on-chain transactions, meaning that any transactions happening on centralized exchanges do not get picked up using the definition above. The good news is that in an ICO, the first transactions (token distribution) happen on the blockchain. The bad news is that a transaction from a personal wallet to an exchange wallet doesn’t necessarily mean the wallet owner has actually sold the tokens. There are a few more problems to consider, but with those caveats in mind, let’s dive into the data by first looking at CoinFi’s N-day retention. As you can see, the graph has the familiar reverse hockey-stick shape of user retention graphs. The biggest drop in retention happens in the first few days, and then it rapidly forms a plateau. 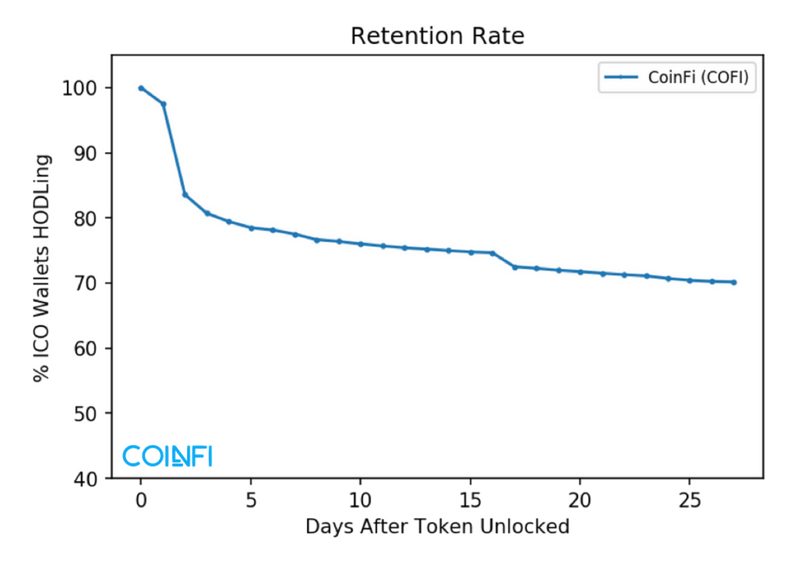 Whereas user retention graphs often drop to a retention rate of around 20-25% after just three days, the COFI token retention rate is at ~70% even after four weeks. The simplest explanation for this token retention being so much higher than app retention is probably that user retention requires activity on the user’s part (usage of the app), while token retention requires inactivity (not sending your tokens anywhere). But comparing user retention with token retention is essentially comparing apples with oranges. Later in this post, we’ll get back to some more meaningful benchmarks. Another concept we can borrow from user retention is cohorts. Basically, we’d like to partition our wallets into meaningful segments. In CoinFi’s case, we had two quite distinct segments receiving COFI tokens: investors and those receiving airdrops. Investors and airdrop recipients have stabilized at around 65-70% retention rate after ~60 days, but investors seem to have moved their tokens faster. Note that this could also be because investment pools (represented by one single wallet) re-distribute the tokens to the participants in the pool. Again, we don’t really know if the tokens were ultimately sold for other cryptoassets or not. But is a retention rate of 65-70% high or low? 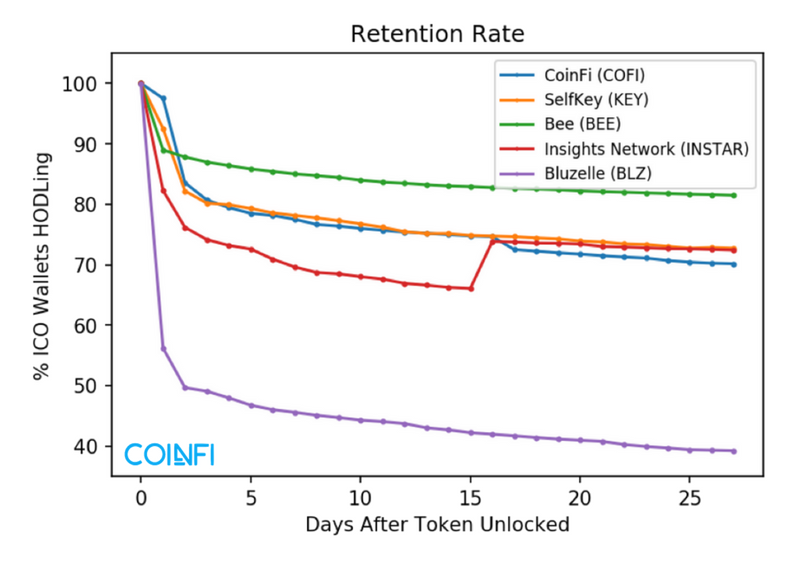 Let’s compare the CoinFi retention graph to a few other ICOs where token distribution happened around the same time: SelfKey (KEY), Bee (BEE), and Insights Network (INSTAR). 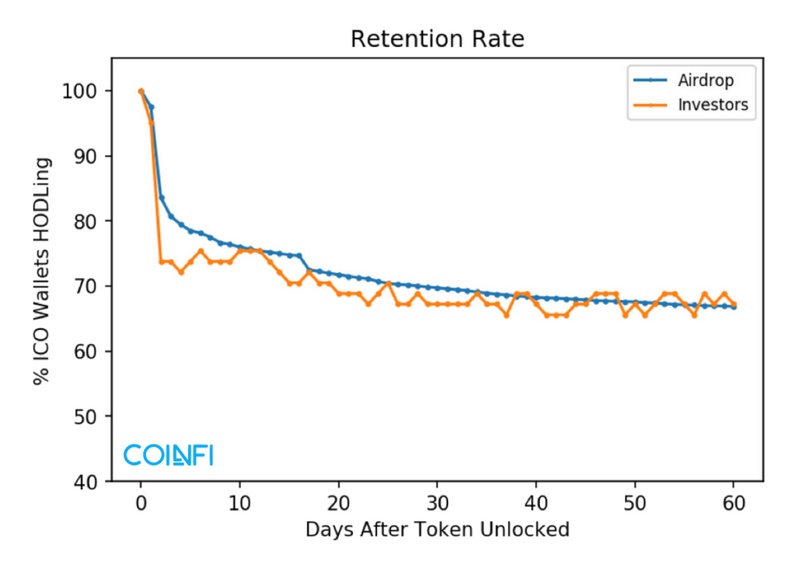 15 days after the token is unlocked, the retention rates range from ~45% to ~83%. That’s a spread of almost 40 points, showing that different ICOs and tokens have vastly different retention characteristics. Interestingly, SelfKey and CoinFi’s retention curves are almost identical in the first 16 days. Bee’s high retention rate is impressive, but it could be explained by two important factors. Firstly, their individual cap was very low (0.2 – 0.4 ETH), meaning less people might be concerned with their investment. Secondly, it took about 30 days before the BEE tokens were unlocked. After such a long time, ICO participants might even have forgotten about the tokens altogether! As noted above, inactivity leads to high token retention. Of course, it is also fully possible that many of Bee’s ICO participants are simply HODLers with a retention rate above the norm. That jump you see for Insights Network is due to an airdrop that happened on March 16, 2018 to community members. In practice this meant that many investors who moved/sold their tokens essentially being HODLers again when the airdrop happened. Finally, is it a bad thing that Bluzelle has the lowest retention rate? Well, Bluzelle actually had the highest return of these tokens when it hit exchanges. So perhaps the causal relationship is reversed: a high price on exchanges might lead people to sell their tokens – because they can then lock in a profit. We won’t draw any strong conclusion from this analysis alone, but in a later post, we will explore the relationship between token retention metrics and token price. Retention metrics will soon be available on the CoinFi platform. We believe such metrics will help crypto investors get a better understanding of cryptoassets listed on CoinFi, and to what extent early investors are HODLing their tokens. What token would you like to see the retention metrics for? Let us know in the comments below or by tweeting at us!